I’ve been thinking a lot lately about IT and its role in the era of cloud computing, API-driven development and increasing interconnectivity. As enterprise computing moves from a server-centric to an application-centric operations model, what happens to the role of IT in a corporation? What is IT to cloud, anyway? Nick Carr famously wrote about the lack of differentiation that IT brings to the business in his 2004 book Does IT Matter?. His argument was essentially that as computing is more and more expected in business, the things IT does for the business provide less and less differentiation. That means that each business owning its own information technology makes less and less sense. If you believe Carr’s vision, cloud computing is one logical outcome. In fact, Carr himself made the argument in his subsequent 2008 book, The Big Switch, where he argued that the increasingly commoditized nature of computing would drive it toward a utility model, like electricity or water. It’s a compelling vision, and one that helped to ignite the cloud computing market we know today. So, is it possible IT departments will fade away completely as more IT services are available from third parties online and there are fewer legal hurdles to creating, analyzing and taking action on data outside of an organization’s own figurative four walls? I don’t think so. I think there is a critical role for a central IT unit in organizations of any significant size (beyond help desks and device management). To understand what that role is, however, we have to explore the nature of the applications being created, acquired and operated in those organizations. We also have to explore what IT has been doing, and why that’s so disassociated from what they would be asked to do in a cloud-centric organization. Think about how computing got its start. Before you could do anything, you needed a computer. Once you had a computer, you needed an operating system, which acted as an interface between the human and the machine. With those things in place, you could now decide how you wanted to apply that computer to some form of problem (or some set of problems). That’s where application software came in. The computer (or the switch or the storage system) was critical to this model. Without the hardware, nothing else happened. So, IT evolved to take on running infrastructure (and, almost always, operating systems, middleware and databases) to support the applications that business units required to do their jobs. This function grew in complexity until companies spent significant budgets on data centers, infrastructure availability, inter-networking and so on. This was the most critical role IT could possibly play for the business. Developers — the ones who ultimately applied computing to business problems — were frustrated with the understandably limited capacity that IT had for addressing software opportunities. Standing up infrastructure is work — often expensive work — and the time and money needed to deliver it could never keep up with the so-called long tail of developer demand. Now, however, the game has changed significantly. General infrastructure is available on a cashflow-friendly basis to anyone who wants it. Add to that the variety of innovative software tools and services that have evolved thanks to the internet, open source and the new economics of cloud computing, and developers are finding utility services a much more palatable option than internal IT for many classes of application development and deployment. 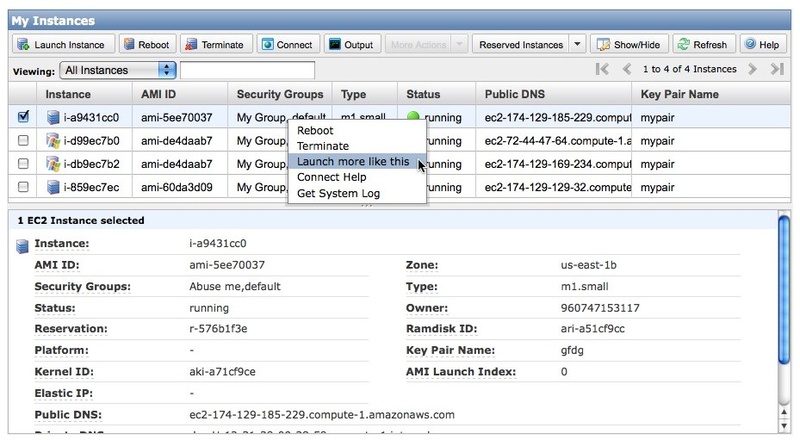 Provisioning virtual servers on Amazon Web Services. When developers think about operations, they are most definitely focused on the applications themselves, not the infrastructure the applications are running on. So IT is getting cut out of the loop in many organizations? Not “officially,” and often in very stealthy ways. However, it is happening, and increasingly in unexpected industries and companies. And while most of this happens with the two critical software classes that cloud enables — web applications at scale, and data collection and analysis — some of it is just developer frustration with IT in general. So what is an IT department to do? I think the answer comes in recognizing what “application-centricity” really means in a complex business. No business runs on one application. No business has only one deployment that they manage, only one executable that must meet the breadth of its computing demand. Every company runs on a system of applications: a collection of highly interconnected, interdependent software components, services and data that must all work as required in order for the company as a whole to survive and thrive. In the era of cloud computing, what the business requires of a central IT department is coordination of the application system — aiding the various application owners with what has to happen for their software to be a “good citizen” within the computing environment as a whole. 1. How does the company handle identity, authentication, authorization, data management, and other central security and compliance-related operations functions that must be coordinated across all of its independent operating entities. 2. How does the company troubleshoot issues that happen when applications interact with each other across operating entity or even development team boundaries? 3. Is there anything that can be done independent of the individual appliations to improve the heath of the system as a whole? 4. Who knows the system as a whole well enough to give the appropriate advice on how to best integrate new application ideas and components? Thus, the primary role of IT moves from running infrastructure to operating software — or, more accurately, assisting developers in operating their software in a larger software system. It’s a consultative role with a number of tools and services that have to be in place and — this is very important — relevant to the developers that IT is supporting. These could be tools to visualize how applications are interconnected and the resources they’re consuming, or services that add intelligence to operations. The core idea is that IT has to let go of trying to control everything and focus on coordinating and enhancing things that other people control. It can be done. Several online companies, including Netflix and Amazon do it today. The result is significantly better agility, experimentation and innovation, with the trade-off that cooperation, communication and measurement are increasingly critical to success. The scary part is that most IT organizations are still infrastructure-centric, or at least “context”-centric if you include so-called enterprise software packages. The move to application-centricity and developer self-service is going to be hard, and require some change of skills and culture. It also means that private cloud is not the most important cloud initiative that IT can take on. I wonder how long it will be until most IT organizations figure that out. Feature image courtesy of Shutterstock user Arjuna Kodisinghe. From an “application-centricity” perspective IT mgmt has never tried to control anything but the people trying to construct and consume IT services. Actual control of the application itself has largely being ignored because it would require IT understanding how things actually work below the surface instead of coarse interaction boundaries. Software services need control more than ever (lets give up trying to control humans) but that control needs to be adaptive and reflecting some policy or goal that aims to influence the behavior of the application which in turn changes how it (or at what rate) consumes infrastructure resources. IT mgmt as well as engineers need to view themselves as creators (as well as destroyers) of universes (infrastructure) and the organisms (applications) that inhabit them. IT mgmt needs to focus more on defining the boundaries, enviroment and resources within this world that influence behavior and adaptation of the software that is run within them. Then sit back and let it evolve and become more resilient as resource stocks are manipulated and new organisms (adaptations) are introduced. If that seems frightfully scaring then “they need to have a systems thinking”. This conversation has been going on for a while now, but it is about to ramp significantly with the advent of integration Platform as a Service (iPaaS). This is about moving nearly everything to the Cloud, including the develop and app management environments. For small to medium businesses, this is just common sense. For larger enterprises, though, it will take time for some fo the control to be pried from the fingers of people who’s entire career has been built in the old paradigm. This isn’t technology disruption as much as individual disruption. It will take time for the larger software and infrastructure vendors to put out offerings that in some ways cannibalize their current business. The smart ones will do it anyway because the alternative is to lose the market to the iPaaS vendors of the future. This is a different kind of ‘Kodak moment’ where digital photography has arrived but film is still doing just fine financially. Agree with The Gnome on architecture, which will go through hybrid steps before embracing Cloud. James, as usual a very well thought out and interesting take on the issue of modern organizations in the age of IT as a Service. I think the key message here is that we need to continue to focus more attention on the “why” versus the “what” or “how”. The reason many IT groups build monolithic infrastructure or new cloud environments is because they are solving the “how”, before they truly understand the “why”. While I agree that the developer focus is important, it’s really a customer focus that should drive how you design your IT organization and the associated technologies and partners that support it. The age old problem is still “how do we best deliver against business requirements?”, the difference is that we now have much greater choice and flexibility. However, that choice and flexibility can save you or get you in trouble, it’s all up the the IT group. Nice post James. I like your line about IT becoming better at coordinating, consulting and enhancing while troubleshooting and allowing the enterprise to work faster and smarter on their own without limitations from the IT department. How does the company troubleshoot issues that happen when applications interact with each other across operating entity or even development team boundaries? To answer the above, a cohesive SLA with demarcation points must be coordinated and agreed upon with clear demarcation points. Right on with general sense, and you might mobile to the mix as well. One piece that I believe bears more focus however is the role of IT in partnering to create innovation in systems and in product or service delivery. It’s all moving too fast and there are too many choices; someone needs to own constantly redefining the art of the possible to deliver better applications, transform business processes or create entirely new business lines. IT can play that role. IT can also add new value in areas like how to do usability. My non technology friends are actually interested now in big data and mobile and how they can apply. IT can be their partner. On a tactical level IT can help the business avoid dead ends and unforeseen governance issues by providing appropriate standards and asking the right questions, while being seen as partners and not the department of no. Think about all the business people that ” self medicated” with Dropbox , not thinking through the requirements to collaborate at any scale or the governance issues of simple things like someone losing a device or leaving the company. All in all, while scary, this is a great time to be in IT. Nice post and something I’ve been thinking about for some time. I’ve been doing more and more consulting gigs where clients have asked for system to allow them to build their business applications themselves, as they don’t want to go through the traditional IT development project pain. I thought i was impossible at first, but after a couple of proof-of-concept projects, now I’m a believer. One billion-dollar insurance company I worked with wanted an empty “foundation” upon which they could get their business people to build the applications they wanted. After half a day of training they started work. I went back a few months later and they’d created several useful applications, including a full service insurance underwriting and claims management system with over a thousand screens. It was live than they were using it every day to handle hundreds of millions of dollars of business. Total IT time after my half-day of training? Zero. Scary stuff – the world is changing. They built what they wanted and were using it, much quicker than they could have specified what they wanted in the traditional way, and saved millions of dollars in the process. I’m working on a cloud-based version of these concepts (appeos.com) that can be used by any business person to build “line of business” applications themselves. This is the future. Clearly, we are in the early stages of cloud computing penetration and it will be interesting to watch how organizations adopt and adapt to take advantage of these new enablers. Good blog, as usual. Yep, infrastructure-centric IT is changing – “instead of running the servers, IT should focus on running the systems & services”. As you had mentioned many times, and we had discussed, IT should move from ops to devOps. the “Launch One more like this” is very deceptive – things like redundancy, resiliency and replication at the data layer, still need expertise more than that can be amassed by a menu click. Of course, SaaS takes care of these concerns. That brings another dimension to IT – SaaS whatever you can and develop the rest – which is still an IT job. I agree strongly with “The Gnome”. Many shops that I’ve seen, still continue to build very “monolithic” infrastructures that continue to require scaling more and more vertically to continue to facilitate their storage, processing power, and other resources requirements. Of course then they suffer larger costs to upgrade, risk a potential choke point of failure, lack of easy control to scale up and scale down systems/services in the event of a spike in traffic, data, “widgets”, whatever. It really does seem like the limiting reagent here is the bean counters, managers, and sysadmins in the ditches almost equally. The bean counters don’t want to hear those massive purchases you may be making may not have been necessary. Managers don’t want to risk input from subordinates on major infrastructure changes. And most sysadmins that I’ve met seem to have issues thinking in the clouds and escaping the box. (Cute pun I thought). The irrelevance of IT is always an interesting topic, and cloud is certainly a driving force. I think the article may focus too much on development needs, however. Many large businesses have departments and divisions deploying software packages with little development needs. IaaS and SaaS are just as important as PaaS. In fact, many companies have their own development within IT (though this too is changing). We are seeing the need to spin up a server infrastructure faster than even our internal IT department can even with its own virtualization efforts. A huge hurdle in all of this is also finance – cloud shifts from capital to expense, and not all IT departments or even business units are prepared for that. It is not just IT that needs to change and mature. A strong Enterprise Architect group is needed to help all parties get over these hurdles. Great post James, the significance of the change that’s required in IT to transition could well the nail in its own coffin. I think it’s likely most IT departments aren’t equipped to manage this level of change with irrelevance increasing as its ability to keep up with the demands of the business or the technology it’s using continues to lag. IT as a department will have to change as you describe but I think it will be because it breaks rather than be a smooth transition. It’s going to be rocky road ahead.